"The Lynyrd Skynyrd Story" börjar väl egentligen sommaren 1964 när Gary Rossington, Allen Collins och Ronnie Van Zant började spela tillsammans för första gången. Vid den tidpunkten spelade Gary Rossington(gitarr) i ett band som hette "Me, You, and Him" tillsammans med Bob Burns(trummor) och Larry Junström(bass)-vilken sedemera blev medlem i 38 Special. Ronne Van Zant sjöng för tillfället i ett annat band som hette "Us". Allen Collins(gitarr) i sin tur plockade justa "southern notes" i ett annat band som kallade sig för "Mods". Både Allen Collins och Gary Rossington var runt 14 bast (ett år till moppe) medan Ronnie Van Zant var ett par år äldre. som golvade honom fullständigt. Efter spelet sökte Ronnie upp dom andra grabbarna för att se om Burns var ok.
att det både lät och funkade bra, varefter dom bestämde sig för att börja spela tillsammans. Många år senare kommenterade Rossington det hela så här: "That was it, that was the start of Lynyrd Skynyrd. After a while, the group decided that they needed another guitar player because, as Rossington put it, "I didn't know barre chords real good, and the little amp built into my guitar just wouldn't cut it. We knew this little skinny kid, Allen Collins, who had a big amp and knew barre chords. He was good, you know." So they went looking for him. When they found him he was afraid that Van Zant, who had a reputation as a brawler, was going to beat him up. He ran from them, and they had to chase him down. When he realized that they just wanted to talk, he was so relieved that he agreed to try playing with them. They took his amplifier over to the Burns' garage, where, according to Rossington,"We stuck both of our guitars in the bright channel, and Ronnie put his microphone in the normal, so we were all three on one amp, and Bob played drums. That was how it started." Allen Collins For the next few years, under a variety of names (The Noble Five, The Wildcats, The One Percent, among others), the new band played teen dens, church socials, and local juke joints. Influenced by the British bands - the Beatles, the Stones, the Yardbirds - the boys grew their hair long, which in those days meant barely brow-or ear-length. It was still long enough to get them in trouble at school. To comply with the dress code, they would slick it back with vaseline for class, and comb it out after school. But they had to shower after gym, and their coach, Leonard Skinner, often caught them literally with their hair down. That resulted in so many trips to the principle's office, and so many suspensions, that eventually the boys quit school. They wanted to escape the hassles, and to be able to devote themselves full-time to the band. A few days after Rossington, the first to quit, left school, they played a gig at Jacksonville's Forest Inn. When he introduced the band, Van Zant said, "We're the One Percent, but we're gonna change our name tonight. Everybody who wants to change it to Leonard Skinner, applaud." The crowd knew the story, and they knew Skinner - the applause was deafening. So the band kept the name, changing the vowels to Ys in a token attempt at anonymity. Green Cove Springs. The 99 acres of "cows and mushrooms" contained a little wooden house with a tin roof, which became known as the "Hell House", with good reason. It gets very hot in Florida in the summer, especially under a tin roof with no air conditioning. (When the band later worked under stage or screen lights, they took it in stride, and didn't seem to sweat as much as other groups. They were used to the Hell House temperatures of two hundred or so degrees, and could, so to speak, take the heat.) It was here in the Hell House that the sound of Lynyrd Skynyrd was born. Working sun-up to sun-down, writing and rehearsing, the band began to take shape. They won a Battle of the Bands in Jacksonville, and landed their first tour, as the warm-up band for Strawberry Alarm Clock. of the band had made a grand total of $10, from which they had to furnish gas money). produced "Journey", and mixed "Lynyrd Skynyrd 1991". 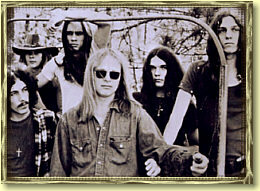 By the fall of 1970, Skynyrd had not only a road crew but a manager, Alan Waldon, brother of Capricorn Records' Phil. He arranged for them to record their first demos, at Quinvy Studios outside Muscle Shoals, Alabama. Quinvy was the original version of "Free Bird". album for a percentage of the profit, if and when it was sold. So Skynyrd borrowed money, and drove to the tiny northern Alabama hamlet of Sheffield to record for him. There were two series of sessions, in the spring and fall of 1971. 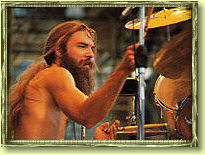 Bassist Leon Wilkeson joined them toward the end of the second series. Billy Powell Billy Powell was one of their original roadies, until Ronnie heard him playing the piano between sessions one day. Asked why he had never mentioned that he was a player, Powell responded that he was happy to have a job as a roadie, and had no ambition to play in the band. Van Zant, however, had other ideas and before long Billy joined Lynyrd Skynyrd. Although Skynyrd was essentially a guitar band, Powell was the one who laid down the musical backgrounds on most of their songs. It's hard to imagine, for example, what "Freebird" would sound like without his keyboards. During the Qinivy sessions, Johnson and his partner Tim Smith taught the band how to record, starting with such basics as putting the bass and drums together to form a rhythm section. Skynyrd had to work whenever there was studio time free, even if it was in the middle of the night, but they were finally recording. During those sessions they laid down the first multi-track version of "Free Bird", as well as "One More Time", "I Ain't the One","Trust", "Gimme Three Steps", and twelve other songs. Ronnie affectionately dubbed the Muscle Shoals studio crew "The Swampers", and paid tribute to them on "Sweet Home Alabama". It was at Funnuchio's in 1972 that Skynyrd ran into Al Kooper, who was in the process of launching his MCA-backed Sounds of the South label. Kooper had played with Bob Dylan's first electric band on "Bringing It All Back home", and was one of the forces behind Blood, Sweat, and Tears. He also worked with Steven Stills and Mike Bloomfield on the "Super Session" album. Gary Rossington said, "Kooper was big-time to us, so we were honored and freaked out that he was out in the club listening to us. Then the next night, we looked out and he was in the same seat, so after the gig we stopped and said, "Hey, what's going on?" The upshot was that Kooper offered the group a contract, and after some initial hesitation, they accepted. Unsure of his ability to handle the big time, bassist Leon Wilkeson left the band. In the search for his replacement, Ronnie remembered Ed King of Strawberry Alarm Clock, and somehow located him at the small bar in North Carolina where he had been working. King came down to the Hell House for a series of frenzied rehearsals, and entered the studio with the others for the Kooper-produced demos. These were recorded at Studio One in Atlanta in one live session that lasted until 3:00 AM. Of this session, Kooper said,"We recorded everything in one day onto two-track. They were so good, so well-rehearsed, that we ended up using the stuff that didn't go on the album for the B-sides of the singles." At this point, the band had a catalogue of almost twenty songs. Deciding which ones to perform, and how, made Skynyrd's sessions with their new producer fairly tense. Kevin Elson remembered that "there was always a touch of tension. Al had a lot of arrangement ideas and keyboard ideas that the band didn't agree with initially - but I think that the tension and arguing made for a better record in the end. The band would never back down from what they wanted, and Al didn't tend to back down anyway. Kooper himself said,"I taught them how to use the studio. I also taught them how to use the bass and the bass drum in a competitive way. But of all the bands I ever worked with, they were the best-arranged. What they did with guitar parts was truly amazing - they had the pulse of the street. They absolutely had it. What fights we had were over my editorial decisions, and I was often outvoted. Ronnie ran that band with an iron hand." Kooper's knowledge of modern recording techniques gave the band new tools. A stand-out example is the overdubbed track of "Free Bird", where Collins added a second guitar part slightly behind his solo. This created the dual guitar sound, reminiscent of Wishbone Ash's "Phoenix", that climaxes the album. "(pronounced 'leh-nerd skin'-nerd)" was recorded at Studio One in Doraville, Georgia,(home base for the Atlanta Rhythm Section) and engineered by the brilliant Rodney Mills. Mills specialized in getting guitars to speak for themselves, and no band ever offered him a better opportunity. His work with Skynyrd began with "Simple Man", and continued throughout their career. Al Kooper was practically a member of the band on "(pronounced)"; under the pseudonym of "Roosevelt Gook" he played bass and mellotron and sang back-up. they found that Collins' stabbing Gibson Firebird, Rossington's whining Les Paul, and King's metallic Strat chops complemented each other amazingly well. Although they had already written most of the songs that would make up the album, "Second Helping", the new line-up resulted in a burst of creativity. "Sweet Home Alabama" was written even before the first album was released. The Who's Peter Townsend had heard and liked "(pronounced)", and he got Who manager Peter Rudge to sign Skynyrd to open for them on the "Quadrophenia" tour. Skynyrd were used to playing small clubs, to audiences of two to three hundred people, and opening night found them facing a crowd of 20,000 at the Cow Palace in San Francisco. They were terrified, and decided to cope with it by getting as drunk as possible. They tore through their five-song, twenty-minute set in a state of panic, but the crowd liked them, and they got good write-ups. The band did well on that tour, and even managed to earn encores, which was quite a feat for a little-known band in the face of a rabid Who crowd. About halfway through the tour, Peter Rudge approached the group with an offer to become their manager. They agreed, and left Alan Waldon. "Gimme Three Steps", made any impact on the charts. When Kooper took the band into the Record Plant studio in Los Angeles to begin recording the second album, everyone was feeling the pressure to produce a Top Forty hit. time, especially the day that John Lennon walked into our control room. They all froze - that was the end of work that day." Van Zant wanted to record "Sweet Home Alabama" as "Second Helping"'s single, but both Kooper and the MCA brass thought it was too regional. They opted for "Don't Ask Me No Questions" instead. In fact "Don't Ask Me ..." didn't do well, and three people from the MCA promotion department decided to push "Alabama". MCA's southern promotion team of Jon Scott, Mike Scherlock, and Leon Tsilis got Top Forty stations to start playing the song, and it became an enormous hit in the southern states. The popularity of the song kept growing, and eventually MCA couldn't ignore it any longer. They released "Alabama" as a single in June of 1974, and it became Skynyrd's only Top Ten single, peaking at number 8. By September, both "Alabama" and "Second Helping" were gold records, followed in December by "(pronounced)". Artimus Pyle The success of "Alabama" had another consequence; it identified Skynyrd as a "Southern Band"; MCA's decision to add a Confederate flag to their live stage backdrop completed the image. The common conception is that Ronnie Van Zant was some kind of Dixie reactionary, but the truth is that his lyrics express the frustrations and aspirations of the downtrodden everywhere, not just of the South. There is something traditionally Southern, however, about the way his outrage was often mixed with humor, a wry blend that has been characteristic of the region since the loss of the War of Northern Aggression. Lynyrd Skynyrd toured extensively in support of their first two albums, and it became too much for Bob Burns. Pleading exhaustion, he left the band, and was replaced on drums by Artimus Pyle. When the group went into Webb IV Studios in Atlanta in January of 1975, they had only one song ready for recording. This was "Saturday Night Special", which Burns had recorded with them before his departure. In 21 days, averaging 16 hours a day, they managed to crank out seven more songs, but the quality of the material was a sad falling-off from the previous albums. There was a reason that Van Zant named this one""Nothin' Fancy". The band went on a 90 day, 61 date, "Torture Tour" in support of the album. Although it was a commercial success, the tour left a trail of fistfights, wrecked hotel rooms, sloppy performances, and cancelled dates. Van Zant said of this tour,"We were doing bottles of Dom Perignon, fifths of whiskey, wine, and beer. We couldn't even remember the order of the set; some guy sat crouched behind an amp and shouted it at us. We made the Who look like church on Sunday. We done things only fools would do." Halfway through the tour, Ed King left the band, unable to cope with the pace and the lifestyle. Collins and Rossington divided King's parts for the remainder of the tour. Allen and Gary in Southern Boogie position !